The big screen fills with images. A lone male wolf looks up a snowy slope. On that slope stand the seven wolves of the Lamar Canyon pack, staring back at him. Suddenly, the three Lamar adults and four pups, tails raised, sprint down the hillside toward the loner. 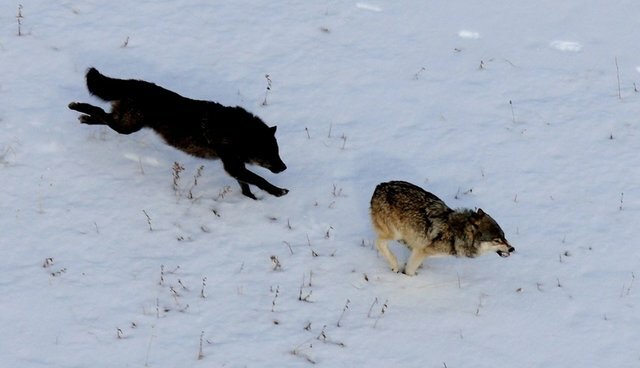 Kira Cassidy of the Yellowstone Wolf Project, the presenter of the video, reveals that the lone wolf had been approaching the Lamars for a few hours. Wolves are territorial, don't like intruders, and post plenty of KEEP OUT signs. One of those signs, their scent marks, can last as long as three weeks in the wild. Wolves also claim territory by howling. Did this lone wolf miss the scent marks or howling? Did he disregard them? Was he trying to join the pack? Did he have his eyes on one of the females? Only he knows why he chose to approach, but when he sees the seven charging wolves, he knows it's time to split. He bounds away through deep snow. The Lamars, following in his tracks, quickly gain on him. Two black males lead the chase. One is 755M, the alpha male. The other, 754M, is his bigger brother. Next come the pups, two males and two females. Bringing up the rear is the pack's famous alpha female, called 06 (oh-six) by wolf watchers. Rick Lamplugh lives near Yellowstone's north gate and is the author of the Amazon best seller In the Temple of Wolves: A Winter's Immersion in Wild Yellowstone. Available as eBook or paperback. Or as a signed copy from Rick.